You are here: Home / Blog entry / My first night in KL Kuala Lumpur. 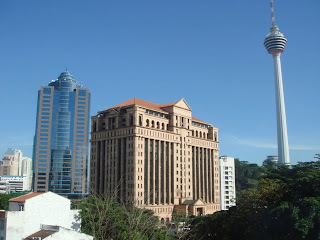 My last post came from the Citin Hotel in KL, on Jalan Pudu. Jalan Pudu is the road that links you from Chinatown up to the Golden Triangle area of Bukit Bintang etc. It’s therefore a short walk either way to get to these centres, without being smack bang in the noisy middle of it. Although J Pudu is a busy road, you can’t hear it from inside the hotel. Indeed, the first room they put me in, had air-con so rattly and noisy that I could hear nothing but, and I went back to reception to ask sweetly if might have a different room. The room…see the turquoise above the bed? I felt like a queen. 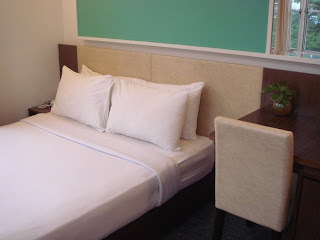 3 large windows gave me a vista on KL, and the room itself had high ceilings, a big flat-screen TV and bar fridge, and a soothing colour scheme of cream and turquoise with the odd chocolate brown touch here and there. 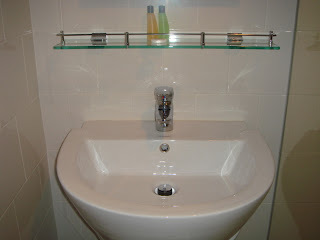 A modern clean citrus green bathroom with frameless shower fairly zinged. 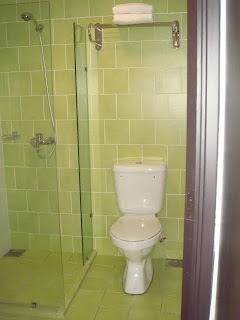 But one can’t stay in one’s hotel room on holiday, no matter how nice it is (honeymooners excepted). 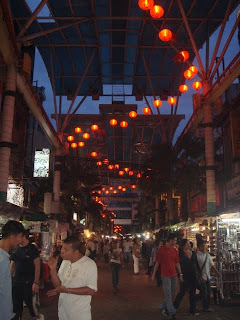 I set off on the first night for Jalan Petaling Street – the Khao San Road area of KL, if you like. Although it was raining, this area is under cover, so you can haggle and ogle and purchase to your heart’s content without struggling with your brolly. As I remembered, there were night-market stalls everywhere, largely selling knock-off designer handbags, wallets, watches and perfumes. I got done for a leather wallet that I knew full well wasn’t Hermes. I sidle up, eyes drawn to the aqua and lime green wallets. The stall owner first says “250!”, then, “for you, 125”. “75”, I say, confidently. He shakes his head. “It is leather, ma’am, feel it, smell it. No vinyl, like these ones”, and he showed me some cheaper pvc ones. I smelled the leather. He smelled a sale. He came in for the kill. I didn’t even really want the wallet, but before I knew it, I’d countered his offer with “90”. (Doh! Should have said 70). He looked momentarily pained, then smiled brightly and agreed, “ok – 90”. It was then I knew I’d been had. Oh well 30 Aussie dollars for a leather wallet aint so bad. And it was the fun bargaining experience I was REALLY after. After a saunter round the rest of the markets, checking out the tropical fruits and other foods, I decided I’d try a new part of town before the night was through. Luckily, the showers had slowed to a very fine trickle. 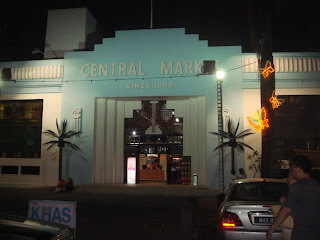 After checking out the Central Market and deciding its touristy products weren’t for me, I walked northeast on Jalan Pudu and up Bukit Bintang, mentally noting where the malls were for tomorrow’s excursion. 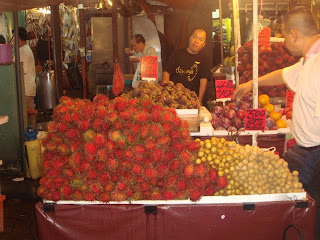 I discovered Jalan Alor, which certainly wasn’t mentioned in my guide book. It’s a street full of, well, street food. Bourdain would love it. There were low-key restaurants everywhere, with plastic chairs and tables on the street for you to eat at. The good thing was, unlike Petaling, this was all about the food. No market stalls of tourist tat anywhere, YAYUH! Yes, there were touts at the front of each establishment, beckoning you in with a glimpse of their menu; I’m fine with that. I knew I wanted Malay food, not Chinese or Thai or Indian. 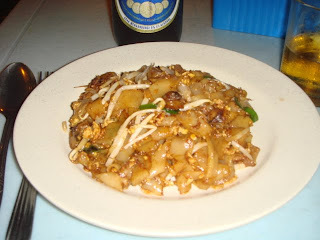 I ended up at maybe the 4th or 5th one down on the left hand side, and opted for chicken satay and kway teow (see below). It was yum!! I reckon, no matter which place you ate at, you’d get a good feed. I asked for a Chang and got a large bottle – but I managed to get through it, hehe. There was the odd monk, seller of postcards, beggar etc that came up, but nothing too obtrusive. (I did give to the monk, despite considering the orange robes may well be for show). vel guide doesn’t mention it, Jalan Alor is a nice buzzy little food street you should check out. It runs off Cangkat Bukit Bintang. 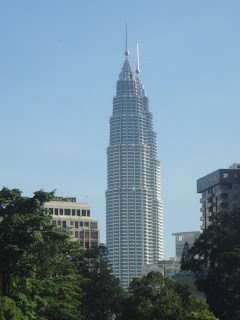 I’ll definitely head there again when I’m next in KL. Stomach full, spirits lifted, I walked slowly home. After the day’s travels and mucho walking, a good night’s sleep was definitely in order!